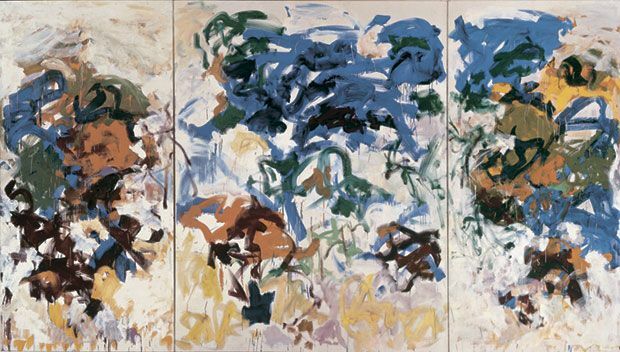 The below artworks are the most important by Joan Mitchell - that both overview the major creative periods, and highlight the greatest achievements by the artist. 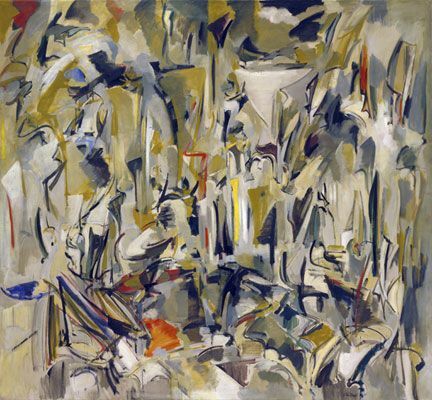 Artwork description & Analysis: Untitled (1951) was one of the seminal works in Joan Mitchell's first solo exhibition at The New Gallery in New York City in 1952. Paul Brach's review announced, "The debut of this young painter marks the appearance of a new personality in abstract painting. 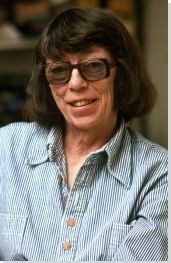 Miss Mitchell's huge canvases are post-Cubist in their precise articulation of spatial intervals, yet they remain close in spirit to American Abstract Expressionism in their explosive impact." Artwork description & Analysis: Informed by an urban energy, City Landscape is an iconic example of Mitchell's early work. The tension between the horizontal brushstrokes of vibrant color in the center with the surrounding whites exemplifies her use of the figure-ground relationship. The work also demonstrates her debt to Philip Guston, whose Abstract Expressionist work was often likened to Impressionism. 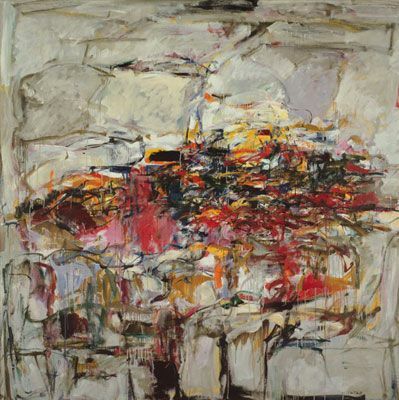 Artwork description & Analysis: Mitchell's paintings are striking in their sheer physicality. 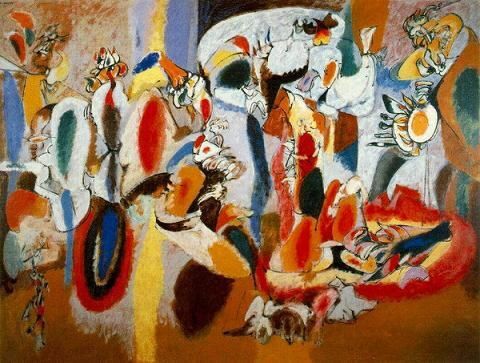 She used bold and active strokes of paint on large canvases. In Hemlock, her use of cool whites interplays with the horizontal lines of green and black and gives the sense of an evergreen in the winter. 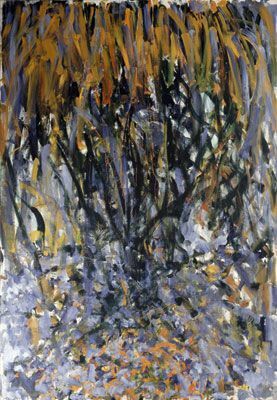 Artwork description & Analysis: Tilleul is one of Mitchell's most direct examples of landscape abstractions. In French, telleul is a linden tree, and Mitchell created a group of paintings inspired by the tree in front of her home in Vetheuil, France. 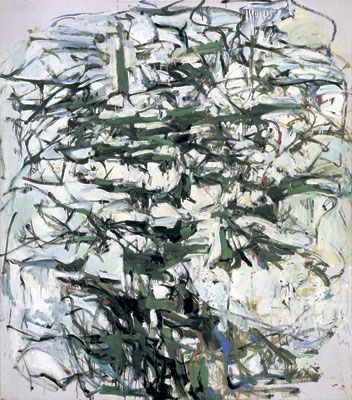 Not a representation, the dense vertical strokes of paint evoke the essence of tree branches reaching upward. Artwork description & Analysis: La Grande Vallee paintings are an outstanding group of 21 large-scale works created over the span of just one year. Uniquely conceived as a whole or unit, the paintings created a lush and poetic environment when exhibited together. The Grand Valley refers to a story of a secret place or private haven and relates to Mitchell's grief over the deaths of her sister and a good friend. Artwork description & Analysis: A striking 15 feet wide, Bracket is a magnificent example of Mitchell's late work. Known for creating large works, her use of two or more panels allowed her to create monumental works of art. She used the interplay between panels as a compositional tool, like paragraphs or stanzas in a poem.